Net sales amounted to SEK 283 M (284). Net sales adjusted for change related items were SEK 283 M (284), which was a decrease of 1%. 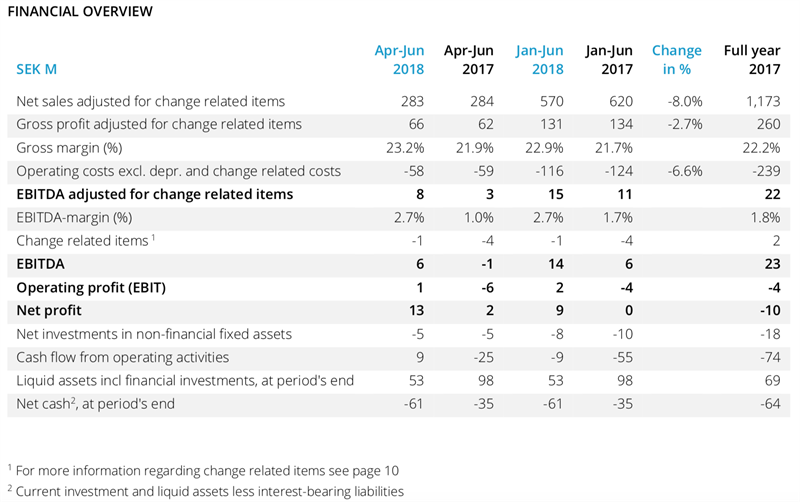 Gross profit adjusted for change related items was SEK 66 M (62), an increase of 6% or 0% adjusted for changes in exchange rates. Gross margin adjusted for change related items was 23.2% (21.9). Operating costs excluding depreciation and change related items were SEK 58 M (59), a decrease of 2%. EBITDA amounted to SEK 6 M (-1). Adjusted for change related items, EBITDA was SEK 8 M (3). Capitalised expenses for product development were SEK 5 M (5). Cash flow from operating activities was SEK 9 M (-25) and the sum of cash and interest-bearing financial assets was SEK 53 M (98) at the end of the second quarter. Net cash in the second quarter increased by SEK 24 M to SEK -61 M.
Earnings per share, before and after dilution were SEK 0.29 (0.04). In May Tradedoubler signed a new financing agreement with a Swedish credit institution of SEK 71. In addition, the company entered into a loan agreement with its principal owner Reworld Media S.A for SEK 40 M. Tradedoubler also announced that conditions are examined for a preferential share issue in the nearer future. Net sales amounted to SEK 570 M (620). Net sales adjusted for change related items were SEK 570 M (620), which was a decrease of 8%. Gross profit adjusted for change related items was SEK 131 M (134), a decrease of 3% or 7% adjusted for changes in exchange rates. Gross margin adjusted for change related items was 22.9% (21.7). Operating costs excluding depreciation and change related items were SEK 116 M (124), a decrease of 7%. EBITDA amounted to SEK 14 M (6). Adjusted for change related items, EBITDA was SEK 15 M (11). Capitalised expenses for product development were SEK 8 M (10). Cash flow from operating activities was SEK -9 M (-55). Earnings per share, before and after dilution were SEK 0.21 (0.00). “In the second quarter 2018 we have continued to make progress in our operational work based on the changes made in the last two years and the foundation created during this time. The effects of these efforts are visible in the EBITDA result and now as well in the gross profit result. Gross profit in Q2 2018 was on the same level as in Q2 2017, a significant improvement compared to the growth levels from the same period last year and the trend of recent quarters. The previously communicated advances in our core business and the phase out of lost customers dating back to late 2016 and early 2017 as well as those linked to the active closure of unprofitable clients formerly managed in Telford explain the improved business results in Q2. Gross profit margin increased to 23.2%. The increase is linked to the reasons above as Tradedoubler`s core business has healthier margins than we had with previously lost clients. On EBITDA we closed the quarter with a result of SEK 8 M, an improvement as well compared to the same period last year. This result is linked to the improved gross profit and a lower cost base as the effect of the changes in the company structure and way of working we have applied during last year. As previously communicated we examine the conditions of implementing a preferential share issue. No decisions have yet been taken. This information is information that Tradedoubler AB is obliged to make public pursuant to the EU Market Abuse Regulation and the Swedish Securities Markets Act. The information was submitted for publication, through the agency of the contact persons set out above, at 08.00 CEST on 16 July 2018. Numerical data in brackets refers to the corresponding periods in 2017 unless otherwise stated. Rounding off differences may arise.